2009 Predictions and Forecast: Baked in the Cake? It’s time to make our predictions for 2009, so welcome to our first ever Great Ubiquitous Extra Special Story of 2009, code-named GUESS. Yes, it’s a guess, since none of us knew what would happen in 2008, so trying to guess at what 2009 and will bring us is tantamount to throwing darts at a dart board, but so be it. Obviously you believe that gold will be up in the first quarter, fade going into the summer, and then increase as the year goes on. You are predicting up for the Dow in the first quarter, a drop in the second and third quarter, and a partial recovery going into the end of the year. Your predictions appear to fall into two camps: some of you believe that Obama will be a great president, and things will improve in 2009 (although most of you are predicting a drop in the second quarter). Others believe the opposite: we have already started down the slippery slope of a new Depression. I think the discussion of the economy, and the potential success of the Obama presidency, misses the point. The real question is this: if there are more tough times ahead, are those tough times already “baked into the cake“? Has the stock market already discounted the tough times ahead? Many news reports suggest that up to 200,000 retail stores could close in 2009. If each store has ten employees, that could be 2 million jobs lost. That’s a huge number. And, presumably, a reduction in retail stores means sales also decrease, causing even greater job loss amongst all of the suppliers to those stores. We had the sub-prime crisis in 2008; we have not yet had the “credit card crisis”. For at least the last ten years the economy has been driven by purchases on credit, many of which were made with credit cards. As people lose their jobs and see their income’s decrease, and as they lose the ability to refinance their homes to repay credit card debt, it’s inevitable that an increasing amount of credit card debt will go into default. That will further hurt the banking industry, and will probably require another “bailout”. I don’t believe the real estate market has bottomed yet. Falling prices reduce homeowner’s perceived wealth, so they buy less, and that further weakens the economy. As consumption decreases, many stores in shopping malls will close and remain empty, drastically reducing commercial rents. Obama has hinted that the unemployment rate could reach 9%; a 10% or higher rate is also possible. As the economy falters, government tax revenue declines, which will lead to a dramatic reduction in government services. The massive government bailout of 2008 will continue in 2009. Government spending today = inflation and higher taxes tomorrow, and that’s not good for anyone. I could go on and on, but I think I’ve made my point: we are not out of the woods yet. However, that’s not the issue. The issue is: will it matter? Is all of this bad news already baked into the cake? The stock market is a leading indicator; investors buy stocks for their future earning potential. It could be argued that everyone knows 2009 will be a bad year, which is why the stock markets fell 40% in 2008. The stock market is a leading indicator, and it’s predicting bad times ahead. I have done a lot of research, reading, thinking and pondering, and based on the evidence I see, I am sad to report that I fall into the pessimistic camp: I believe we will look back on 2009 as the year that the Greater Depression came into the world’s consciousness. As for the new President, I have never met the man. I’m a Canadian, so I did not vote for him, nor did I vote against him. He has great charisma, and he does have the potential to be a transformational figure. He may be the one person who finally begins the process to bring an end to the racial inequality that exists throughout the world. He may end corruption and waste in government. He may. I hope he does. Unfortunately, I am a cynic. I am of the view that the government, regardless of how well intentioned they may be, only has limited power to “fix” the economy. A government generally doesn’t invent new products or technology, or improve efficiency, or do anything to truly create wealth, and that’s why I don’t believe the world will be a perfect place in 2009. We are currently experiencing a temporary deflation. Technically, a deflation is best defined as a decrease in the money supply. The government is printing money like crazy, but when you add up stock market and real estate market losses in 2008, there is little doubt that the supply of monetary wealth fell in 2008. The impact of this deflation is well known to all of us: falling prices. In 2008 we saw prices fall for real estate, stocks, and commodities such as oil. “Deleveraging”, the word of the year in 2008, saw hedge funds and everyone else sell whatever they could, further depressing prices. However, once the sellers have sold all they have, once the deleveraging is complete, we will be faced with a massive increase in the money supply, thanks to the bailout. That increase in the money supply thanks to government spending will have one result: inflation. Let me be clear: I am not aware of any other time in human history where massive increases in government spending did not lead to a decline in the value of the currency, and massive inflation. (If I’m wrong, post your facts on the Forum, please). To protect wealth, there will be only one logical place to put your money: gold. The economy has not yet bottomed. Real estate will continue to fall. Retail stores will close. The automotive sector, and virtually every other sector, will continue to feel pain. Jobs will be lost. The government will try to spend their way out of it. The U.S. dollar will fall. Inflation, eventually, later in 2009, will rise. We will be looking for a safe haven. And that safe haven will be hard assets like gold, silver, and perhaps even uranium, lithium, and the like. After a great 2006, I lost a lot of money in 2007 and 2008. I don’t intend to go three in a row. I will stick with gold stocks, and I will maintain cash and some downside protection with bets on further market weakness. 2008 was a bad year, not because I lost money, but because I lost money stupidly. I was stupid, because I have my own set of investment rules, and I didn’t follow them. I have a 20% stop loss rule. If a stock falls 20% from it’s peak, I sell it. By doing that, it’s theoretically impossible to lose more than 20% on a holding. Since I was down 40% in 2008, I obviously didn’t follow that rule. (Mathematically that’s not entirely correct. Losses of 19% on a number of stocks can obviously add up to more than 20% over the course of the year, which is essentially what happened to me this year). I also erred by not taking profits when they were there, a mistake I don’t plan to repeat in 2009, if and when there are profits. So, in conclusion, my prediction is for a down year economically in 2009, but an up year for gold and silver, which is where I plan to park my money. I will keep a closer eye on things this year. If a stock is up and if it’s RSI goes over 70, I plan to take some profits, since nothing goes up forever. 2009 will continue to be volatile, so selling now may simply free up cash for another day. There is, of course, a very good chance that I will be completely wrong. A look at the gold chart for the three year period ending December 31, 2008 clearly shows we are still in a downtrend. 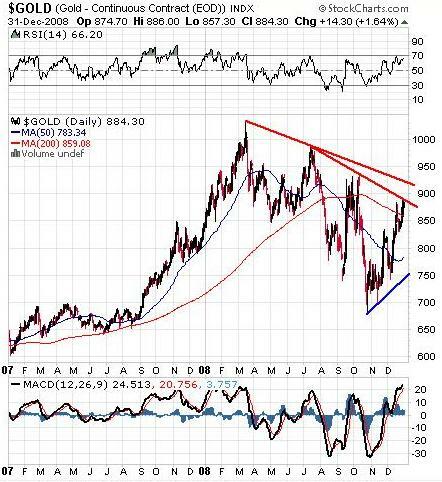 It is therefore reasonable to expect a pullback in gold early in January, so covered writing on stocks we like, or selling a portion of our holdings to raise cash is probably prudent. However, I believe a higher gold price is baked in the cake for 2009, so that’s how I’m playing it. As we start 2009, thanks to all of you for reading and contributing. I created this site to give me a place to write down my thoughts on investing. It’s an added bonus that I get to hear your comments as well, for which I thank you. You can read everyone’s predictions on the Buy High Sell Higher 2009 Predictions page, including JDH’s 2009 Predictions, and you can post your thoughts on the Buy High Sell Higher Forum 2009 Predictions Board. davidslane, richmanch, punter, croaker, uboat, designer, beginner, and REM. Your input is most welcome. Thanks and Good Luck to All, and Happy New Year.